Circulation has been declining since 2013. “Active Users” isn’t defined, but the increase isn’t because they are checking out materials. It shows 3105 people used the free Wi-Fi. That information is not available in the packet for 2018, but it could be contributing to the “active user” data. Since the library is also holding more “programs”, part of the increase could be due to entertainment activities. One thing the numbers do prove, expanding the library because they don’t have space for materials is ridiculous. Fewer items checked out mean fewer items need to be available. 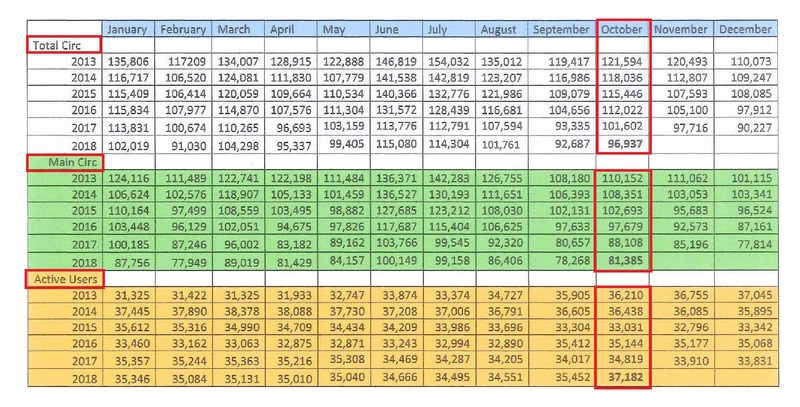 Compare October 2013 to 2018, circulation is down by almost 25,000 items! If expanding the library is to have more room for public computers, comfy chairs for free Wi-Fi, or entertainment programs – the Board needs to publicly say that. The public should decide if THEIR money should fund the alternate purpose of a library. Since the City Council has shown no support for adding on due to budget constraints, for now the issue is likely dead. Citizens need to be vigilant so it stays dead. Posted in - - - Please Contribute - - -, BloNo, Bloomington, BLOOMINGTON CITY COUNCIL, budgets, elections, Local, Renner, Taxes.Tagged active users, Bloomington Public Library, circulation decrease. Overdrive is a popular app that allows checking out ebooks and audiobooks from the library on your phone or tablet. I see the library staff help people load it on their tablets when I have been in there. Is each download of an ebook counted as circulation? None actually goes to the library for this it is just a service offered by libraries. Champaign Library uses Cloud Library, others use Overdrive. Both are apps on your phone or tablet for ebooks. I agree with the above poster. How many of those are counted in the figures above? WHY don’t they take the “RARE BOOKS” section, move it to the museum,and that will give them more room, as people doing historical research will then have EVERYTHING in one spot and NOT have to go back and forth. OR does this make too much sense?? TIME IS MONEY! Total and main circulation are both down about 20% since 2013. If this were a service offered by a private business, they would stop offering the service or seek to improve it, if possible. It’s not possible here. Declines for five consecutive years and an era of open information at the click of an app on a smartphone, PC, or tablet, yet our dear leaders want to make a bigger, newer library. Why not remove “underperforming books” by donating them or giving them away and using the vacated space to house more public computers, comfy chairs, and Wi-Fi enabled tech? We can’t do that, Koos and his Chamber pals need a ribbon to cut. Besides, big city millionaire developers need the money. “This is for the children.” “It will boost the local economy.” “[Insert more non-sense claims here]” I’m all for going more high tech and remodeling the library to fit the modern realities of our day, but we don’t need a new fancy building to accomplish this goal. We can’t stop the wave of technological change that is sweeping across our world. We can adapt to it…and here lies the problem. Our leadership with 20th Century crony capitalist mindsets will NEVER move in directions that spur adaptation. They will always try to solve 21st Century problems and challenges with 20th Century solutions. Enlightened tech savvy leadership would see the library for what it is and chart a path to slowly eliminate it. This will of course not happen here. Caveats up front: I’m pro-library, and I’m a Normal person. If Bloomington wants a new library, perhaps it can be paid for by shuttering the coliseum and rerouting that savings? I don’t have any personal insights into Bloomington Library management, but I know Normal is managed fairly well – 20ish years ago they asked for and got a ‘temporary’ tax increase that stuck around for… 3 years iirc and it was discontinued. I also know Normal has been looking into a newer, bigger library, and one of the first/biggest steps they took towards that was to form a foundation so they could raise Private funds towards that goal. They’ve also had that goal for several years but acknowledged a new building was not going to just pop out of Koos’ ‘wallet area’, so they have already been making changes to layout and other things along the lines of those suggested here. Not Everything government is a boondoggle. But even those that aren’t should still be watched with suspicion, so feel free to question Normal library’s finances, policies, etc. You’ll find the board & management are not a bunch of Koos yes-men like the town council. Next Post 10.5% increase in bus riders!